Added /cfg command-line option to start BrowserAddonsView with the specified config file. Fixed issue: BrowserAddonsView failed to display the extensions of Chrome on some systems, because on new installions of Chrome the extensions list is stored in 'Preferences' file instead of the 'Secure Preferences' file. Added 'Quick Filter' feature (View -> Use Quick Filter or Ctrl+Q). When it's turned on, you can type a string in the text-box added under the toolbar and BrowserAddonsView will instantly filter the addons table, showing only items that contain the string you typed. 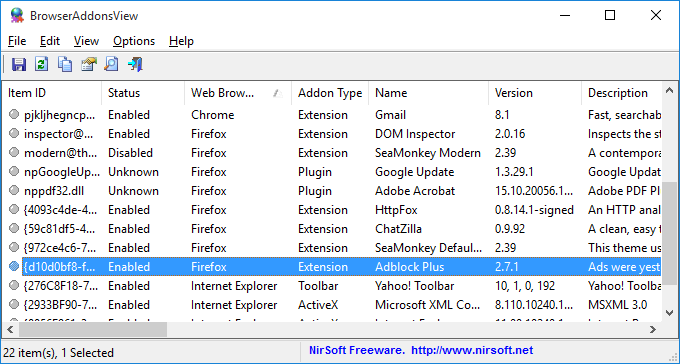 /sjson <Filename> Save the Web browser addons list into JSON file. BrowserAddonsView is also available in other languages. In order to change the language of BrowserAddonsView, download the appropriate language zip file, extract the 'browseraddonsview_lng.ini', and put it in the same folder that you Installed BrowserAddonsView utility.